Day 1194: House. Tree. Person. I scented gaslighting very early on in Catriona McPherson’s newest cozy creepster, House. Tree. Person. That did not spoil my enjoyment. Ali McGovern has a trauma in her past and hints of a nervous breakdown. Her family is in a precarious financial position, too, because her husband, Marco, used her successful salon to prop up his failing restaurant. So, they lost both. When Marco falsifies her credentials to get her a job at Howell Hall, a mental hospital, she goes along with it, thinking she won’t get the job. But she does. She comes home after her first day at work to a different problem. Her fifteen-year-old son, Angelo, is implicated somehow in the discovery of a body on the grounds of an old abbey across the street from the McGovern’s flat. The police think he knows something about it. Marco seems to know what is going on, but neither Marco nor Angelo will tell her. At work she meets a cheerful and supportive staff, but her boss, Dr. Ferris, finds fault with her slightest action. In a catatonic patient, Sylvia, Ali thinks she sees signs of consciousness. She also believes that something is going on with Julie, a teenage patient who claims she’s being held there against her will. 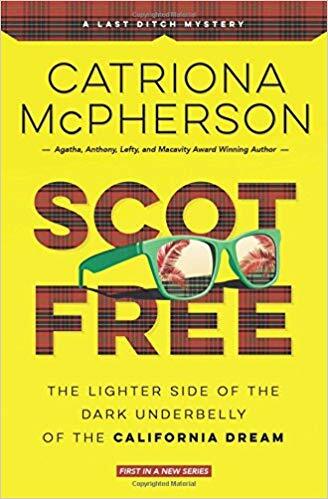 Catriona McPherson has become one of my favorite writers for suspenseful and spooky but light reading. Her characters are engaging, and she creates a strong sense of place in small-town Scotland. House. Tree. Person. is another page-turner from her. 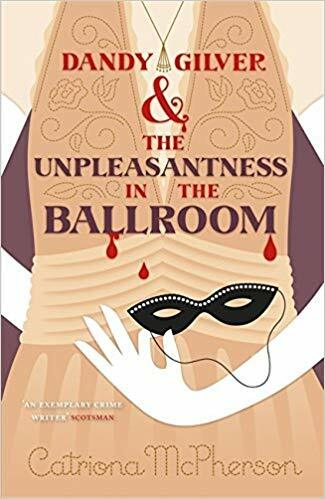 Although I’ve come to prefer Catriona McPherson’s contemporary thrillers, for lighter fare, her Dandy Gilver mysteries are lots of fun. Dandy began her career in 1918 with After the Armistice Ball. Twelve years later, she and her partner Alec Osbourne are more sedate, but not much more. Dandy and Alec’s newest client wants them to skip the family Christmas to investigate a confidential problem. He is a herring exporter, and several barrels of his herring have been returned containing foreign objects, that is, the pieces of someone’s body. Mr. Birchfield does not want to notify the police, because knowledge of this problem will ruin his business. He wants Dandy and Alec to find out who is missing and what happened. Because the herring fishermen and the “quines,” the girls who gut the fish, only return home a couple of months a year, they must travel to the fishing village of Gamrie, on the Banffshire coast, over Christmas. Dandy is all too happy to escape a dreary house party. In Gamrie, the two pose as philologists, supposedly recording the local dialect. The village is an uncomfortable one, with freezing weather and a stark hotel as the only accomodation. The villagers themselves are caught up in the preparations for five marriages. All the brides are pregnant, for the custom is to be handfasted and only marry if the handfasting “takes,” that is, the bride gets pregnant. There is some concern in the village about the marriages of two of the Mason girls. They are marrying two of the Gow boys, who fished in the same boat with John Gow, their older brother. John Gow went overboard last year, and it is considered unlucky for anyone to marry his shipmates unless they take to different boats. But the Gow brothers are keeping their brother’s boat and marrying the two Mason girls, whose older sister was handfasted to John Gow and who disappeared after his death. This news has Dandy checking with Mr. Birchfield that the corpse is indeed male, but it is. Dandy and Alec also have the dubious pleasure, suggested by Dandy’s husband Hugh, of going to visit Searle’s Realm of Bounteous Wonder. This display is a series of rooms depicting various scenes made up entirely of stuffed animals, a wonder of taxidermy. The two brothers, Warwick and Durban, are very odd, and the exhibits are appalling. Dandy and Alec’s investigations turn up no unaccounted for villagers except Nancy Mason, but they eventually hear about several missing strange men, people who came to town but never were seen again. Some of the men were derelicts and one was an artists’ model. At least two claimed to have work. So, Dandy and Alec go from having no potential victims to several. All the while, a terrific storm is threatening. This novel was interesting, from the perspective of the villagers’ wedding traditions and beliefs. Although I figured out fairly soon something about the missing men, I did not figure out the overall scope, nor the identity of Mr. Pickle, as Alec calls the body. This was a fun, if a bit ghoulish, mystery. Keiko is a Japanese exchange student working on her doctorate who has accepted a grant from an association in Painchton, Scotland, near Edinburgh University. Her grant comes with a free flat that has even been stocked with food. Keiko is overwhelmed by everyone’s hospitality, particularly with their propensity for stuffing her with food, much of which she finds unappetizing. Not everyone is welcoming, though. Her landlady Mrs. Poole is the proprietor of the butcher shop below Keiko’s flat. She is a recent widow, but her unfriendly behavior seems to indicate more than grief. She has two sons, Malcolm and Murray, and she certainly isn’t encouraging them to befriend Keiko. She also spends every morning cleaning the seldom-used slaughterhouse in the yard. Early on, Keiko finds a note behind the radiator in her flat. It is clearly from a blackmailer, perhaps to the previous occupant of the flat. She also notices that several women have vanished from town. As Keiko tries to figure out what is going on in town, she also has quite a few misunderstandings with people through not understanding exactly what they’ve said. I had a few problems with this novel that I haven’t had with other McPherson thrillers. For one thing, the reasoning behind the Painchton Trading Association’s grant to Keiko seems so flimsy that I had a hard time imagining even a child would believe it, let alone the entire town. The town committee seems to be up to something illegal, which lends to the atmosphere of the novel. And then there is the resolution of the plot. First, Keiko’s suppositions run so berserk that I started to think the novel was an elaborate joke and that maybe I was reading an updated version of Northanger Abbey. But I won’t say whether I was right or not. So, I wasn’t as happy with this novel as with others by McPherson, particularly as compared to the wonderful Quiet Neighbors. I thought it was obvious fairly early on that one character was dangerous, but Keiko doesn’t realize this until very late in the novel. Still, the novel is atmospheric and the ending is suspenseful, and parts of it are funny, so all that will probably keep most readers happy. At some point, I decided that the heroine of As She Left It just got herself involved in trying to solve too many mysteries. So, I didn’t find this novel quite as good as I have McPherson’s others. Also, there is at least one whopping big coincidence. Opal Jones has moved back to the house in Leeds where she grew up. Her mother recently died, and she then learned that the house was in her own name. Since her life is in some disarray, she decides to move back. Opal hasn’t been to Leeds for 10 years, since she was 13. She also hasn’t been in touch with her alcoholic mother. She has been totally unaware that 10 years before, a little toddler, Craig, whom she used to babysit, disappeared when he was under the care of his grandparents, Dennis and Margaret. Through a series of misunderstandings, each of his grandparents thought the other was looking after him. Opal decides to try to find Craig. Some other neighbors in her street are old men, members of a jazz band with whom Opal used to play the trumpet. One of the old men, Fishbo, says he hasn’t been in touch with his family in New Orleans since Hurricane Katrina. Opal decides to try to find Fishbo’s family, despite warnings from his friends. Opal also finds a puzzle in the posts of part of her bed. Needing something to sleep on, she has bought a magnificent bed for a very low price, not realizing until she got it home that the headboard and footboard are mismatched. In the posts of half the bed, she finds messages of distress, but she needs the other half of the bed to see the entire message. In trying to find the other half, she meets Norah, a little old lady suffering from dementia living in a house full of antiques. Soon she believes that someone is looting Norah’s house of its valuable furniture. Having embroiled herself in these mysteries, Opal begins receiving threats, but she doesn’t know how the threats are connected with the mysteries. There is also the mystery of the person next door, whom she hears crying at night. Since she can’t believe her neighbors would have taken Craig, she wonders if his kidnapper has moved in next store. But then, all of her neighbors seem to be hiding something. Although I liked Opal and was interested in the story, there just seemed to be too many threads to the plot. Overall, I think, it limited the possible suspense of the novel. The coincidence, too, of what happened to the other half of the bed is pretty unbelievable. But a lot of the puzzles are noise, to keep Opal from facing her past. Jude is in trouble, thinking of fleeing the country. But when she gets to the train station, she remembers a kind face, so on an impulse she takes a train to Glasgow. In a nearby village, she walks into Lowland Glen Books. There she is taken under the wing of the owner, Lowell Glen, and sent to his house for an exhausted rest. Jude’s trouble involves her ex-husband Max, but we don’t learn what it is for a while. She is afraid to read the online articles about whatever happened but just sees that they have thousands of hits. Then she destroys her phone. Jude is a library cataloger with a bit of a phobia about disorder. She finds the squalor of Lowell’s home disturbing but is pleased when he offers her the attic apartment to live in and a job helping him catalog the books in his store. She is just settling in when another orphan of the storm arrives, a pregnant Irish teenager who announces that she is Lowell’s daughter, a person Lowell didn’t know existed. Lowell immediately accepts Eddy, but Jude is skeptical. Eddy claims that her mother, Miranda, only told her about Lowell on her death bed, but Jude thinks she is lying about something. She is also upset when Lowell lets her know that Eddy would like her apartment. Lowell has a place for Jude, though, a cottage he owns next to a graveyard. The cottage is so isolated that Jude is happy to accept it, figuring that no one will find her there. She is also enchanted to find that the cottage once belonged to T. Jolly, someone whose brief reviews in the backs of some of the books in Lowell’s store have delighted her. She starts making a collection of his books, but the notes in the later books in his collection take on a different, more ominous tone. 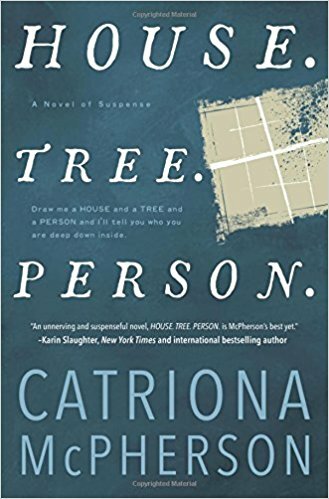 With Quiet Neighbors, Catriona McPherson moves away from contemporary thrillers back toward the mystery genre. Aside from the question of why Jude is hiding, there is a mystery connected with Lowell’s “summer of love” back in the 80’s that engendered Eddy, a mystery of what Eddy’s mother Miranda told her versus the facts they can determine about the time. And then there is the mystery of T. Jolly’s notes. There does turn out to be a murderer, and to me that person’s identity was obvious as soon as murder was suspected. But this did not interfere with my enjoyment of the novel. I loved most of the characters and the warm, unusual household that Lowell, Eddy, and Jude begin to build. I loved what McPherson does with two apparently menacing characters. I absolutely loved this novel.